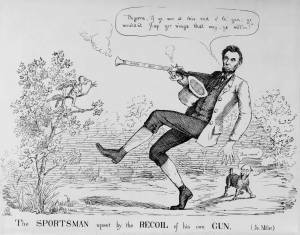 "The Sportsman Upset by the Recoil of His Own Gun"
Lincoln is portrayed as meek and ineffectual is his prosecution of the war. In a wooded scene Lincoln, here in the character of an Irish sportsman in knee-breeches, discharges his blunderbuss at a small bird, "C.S.A." (Confederate States of America). The bird, perched in a tree at left, is unhurt, but Lincoln falls backward vowing, "begorra, if ye wor at this end o’ th’ gun, ye wouldn’t flap yer wings that way, ye vill’in!" At right Secretary of War Edwin Stanton, who has the body of a dog, barks, "Bow-wow."